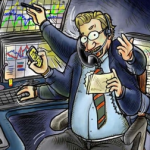 Over the years I’ve seen hundreds (if not thousands) of newbie traders on message boards following simple trading systems that are based on lagging indicators. Because these systems are so simple to understand they are like a magnet anyone who is new to trading. 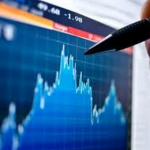 The usual systems which people try to trade are often based on the most common lagging indicators found in any chart platform. The main culprits are moving averages, MACD and stochastic. The reason why these indicators lag is because they are based on calculations of price levels going back X amount of periods. For instance the 50 Moving average is an average movement of the price calculated over the last 50 periods. This is not telling you what the price is doing now, it is telling you what the price has already done over the last 50 minutes, hours, days, or weeks. If you are trading based on lagging indicators alone then to be successful you need to be very lucky. More often than not you will hit lucky once or twice and then fail miserably and blow your account. 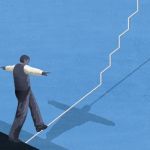 To be successful in your trading with lagging indicators you need to have an edge. The most successful edge to use is a price action based indicator, or better known as a leading indicator. This can be anything from a simple break of a candle high to something as complex as a trend channel break. 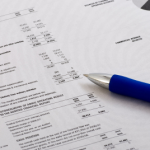 Nine times out of 10 the indicator will tell you NOTHING that price has not already told you. 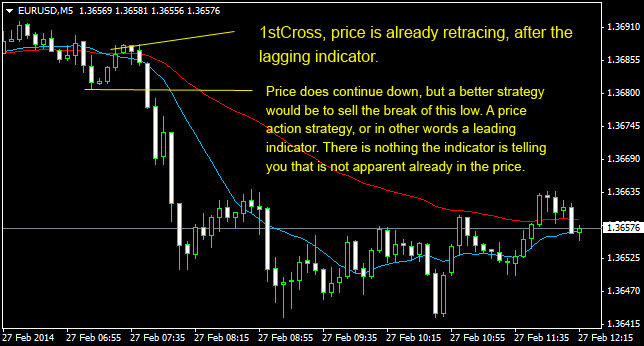 The only use a lagging indicator has is to confirm what you are seeing in the price. If you can’t see the trend forming, a break of the resistance or any other characteristics in the price then you may as well give up day trading now. Let me show you some quick examples, as pictures speak 1000 words. On the chart below you can see the price has already moved up sharply for a whole hour (4×15 minute candles). By the time the 50 Moving average makes a slight turn the price is already topped out and is busy retracing. Not a good place to enter. On the second example price moved sharply down. The moving average does turn down relatively quickly, but let’s face it, if you couldn’t see the move was strong by the characteristics of the candles then what the hell are you doing trading?? 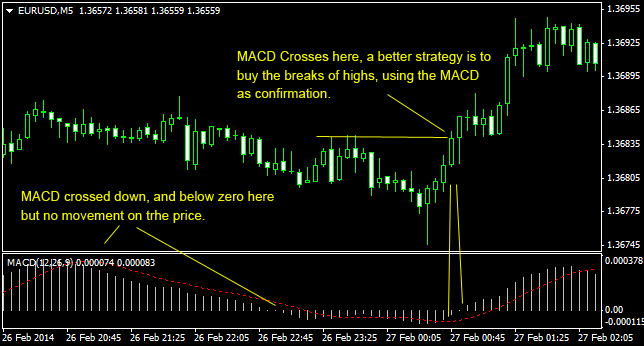 Next we have the moving average cross set up, which is a favorite for people new to trading. This type of system is suited to strong trends, but when the price is consolidating it’s not very accurate and you can be sure you’ll lose your shirt. As you can see, as the first cross down of the blue moving average happens, the price is already retracing back to the averages. If you entered on the cross you would probably be stopped out. If you’d waited for the move to continue, and sold on the break of the last low, using the moving average cross as a confirmation for the trend direction, you would have a higher probability entry. Now we come to an indicator which is a pet hate of mine, the MACD. Simple systems using this lagging indicator are often doomed to failure. It’s common for people to buy or sell the crossing of the zero line, but if you study it you will find it throws out a ton of false signals. In the chart below the MACD has crossed down and moved below zero, but what the does price do? Absolutely nothing, it consolidates, and chops around going nowhere. In the second highlighted example the indicator pushes up above the zero line, at which point many new traders might be thinking about buying. For me the safer strategy would be to buy the break of the last highs, using the MACD as confirmation to the direction of the trend. 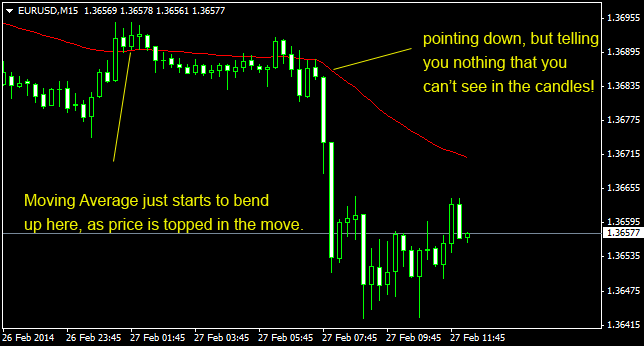 So there you have it, my reasons for not using lagging indicators on their own as signals to enter a trade. Of course they have their uses, but in reality need to be used as confirmation of what you already see the price doing right now.